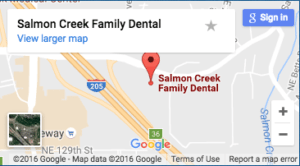 Here at Salmon Creek Family Dental, a General Dentist in Vancouver, Washington, we have many patients asking us about their oral health. One of the more popular themes lately has been patients asking us about bad bites. There are a number of ways of telling if your bite is off. If you tap your teeth together as you normally would, check to see if you hear a sharp sound, this could be the sound of many teeth touching at the same time. If the sound is muffled or you may have a tentative bite? This is the easiest way to tell how your bite is. In general, the softer the closure, the greater chance that your bite is off. Another thing you can do is to put your index fingers on the outside of your upper row of teeth, and then close your teeth. Do you feel the impact on only one or two teeth? You can also try sliding your jaw from left to right. When you slide your jaw off to one side, the back and side teeth should not contact one another. They should come close, but they should not be touching. Your teeth’s purpose is to grind food, not to bite through it. So if they contact each other when you chew your food it is not really a good thing, and this too can indicates a bad bite. However, with some patients there is just no way to balance the existing bite, because the teeth are too far out from where they need to be. We care deeply about your health and confidence when it comes to a great smile. We will sit down with you on your next visit, and discuss your options in detail. We are happy to go over this and all your concerns and questions. Please call today for an appointment.